In early 1946, the Columban Fathers, along with most of the world, were still recovering and rebuilding from the devastation of the Second World War. The war had taken the lives of a number of Columbans, and many others had been through imprisonment or were forced to flee their missions. Columban Father Patrick J. O’Connor had a great deal of experience in journalism and writing, having served as editor of the U.S. edition of The Far East magazine and president of the U.S. Catholic Press Association. In late 1945, the press division of the National Catholic Welfare Conference (NCWC), took notice of Father O’Connor’s expertise and invited him to serve as a special NCWC correspondent for East Asia, based out of Tokyo, Japan. In the March 1946 issue of The Far East, Father O’Connor’s first report from Japan appeared as an article. Father O’Connor served as a roving NCWC correspondence in many Asian countries, and reported on the activities of the Columbans in East Asia, as well as the post-World War II rebuilding. Father O’Connor’s long and fruitful journalistic career continued for many years, and in many countries, including Burma, Korea, China and wartime Vietnam. 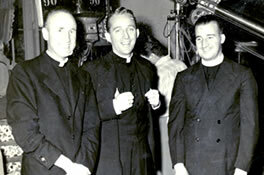 In 1948, Father O’Connor established the Hua Ming News Service in Shanghai, China, and he won awards from the Catholic Press Association in 1956 and 1964. Father O’Connor’s reporting work is indispensable for Columban and modern Asian history and undoubtedly inspired many journalists and readers throughout the years.